How does the sole designer of a healthcare SaaS make the most of a two-day user conference? Bootstrap, Silverback, ERUT (similar to RITE), ethnographic research, usability testing, focus groups, voting, interviews. Alex is an exceptional person to work with, and easily works with developers such as myself... Her varied background is an underrated asset. It allows her to understand and solve problems from multiple angles, allowing for a more complete and thorough solution. The annual Kinnser user conference is a big deal: home health agencies (both existing users and potential customers) and related vendors come from all over the U.S. to network, see the latest technology, and get a preview of what’s to come. Three months after I became Kinnser’s first and only software UX architect, I knew this was a perfect opportunity to get to know Kinnser users up close. I had to make the most of it. 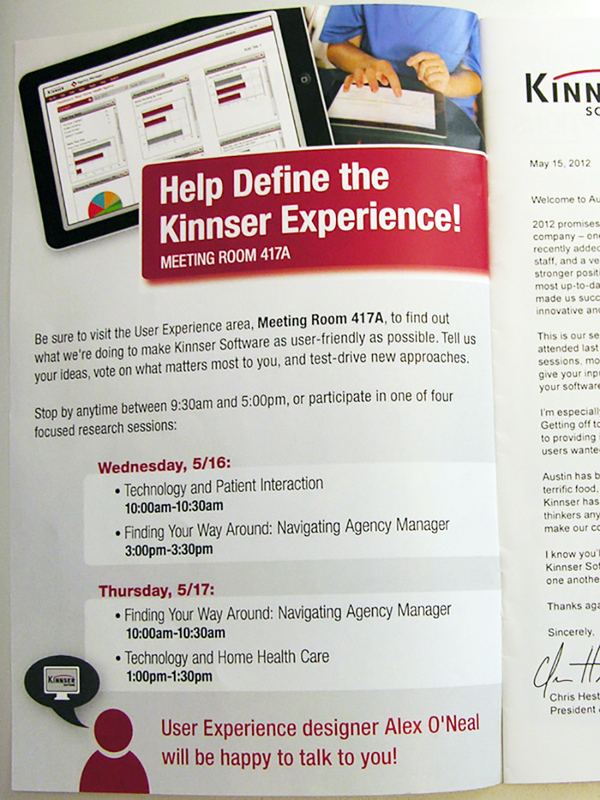 To make this work, Kinnser reserved a large room at the conference hotel, and Kinnser marketing advertised its presence on the inside cover of the conference brochure. I did not design this ad (marketing and Kinnser.com belonged to a separate department; I owned Kinnser.net UX, where the healthcare SaaS lived). I was thrilled by the ad placement, and UX got a great response. Finding Your Way Around: Navigating Agency Manager (Agency Manager is Kinnser’s primary SaaS product). Silverback captured screen behavior and audio; I also captured extensive written notes. I had test-specific pages ready for fast note-taking. Apart from the scheduled focus groups, ad hoc demonstrations to groups of users were shown using prototypes I created. For this and testing, I repeated the same questions, but also explored new avenues of research as prompted by user feedback. A voting wall of possible new ideas and needs, both from users and from myself and the product team, was available for voting. Visitors were given three stickers and could vote on the idea they found most valuable by placing the stickers on the relevant poster(s). Posters consisted of a headline, description, and visuals. I moved these around occasionally to reduce the chance of placement driving voter choice. I also allowed visitors to suggest new posters, which were added the second day. Fresh posters were used to start voting from scratch the second day, but I added up totals from both days. This feedback was extremely helpful in driving UX direction. During the process, I also built up a strong network of potential beta testers and users willing to email me with feedback and ideas. The voting wall, a last-minute idea, was surprisingly useful. I discovered that some of the most popular items were the simplest. For example, Kinnser SaaS currently had seven (yes, seven) different ways of entering dates—most frustrating for a busy nurse performing patient data entry. Making all date entry form elements conform to a single standard was a highly popular poster. Another popular item was a consolidated help access panel, presented in an innovative manner from the top navigation.